Russian President Vladimir Putin and ExxonMobil CEO Rex Tillerson shake hands at a signing ceremony of an agreement between state-controlled Russian oil company Rosneft and ExxonMobil at the Black Sea port of Tuapse, southern Russia, June 15, 2012. President-elect Donald Trump selected Tillerson to lead the State Department on Dec. 13, 2016. 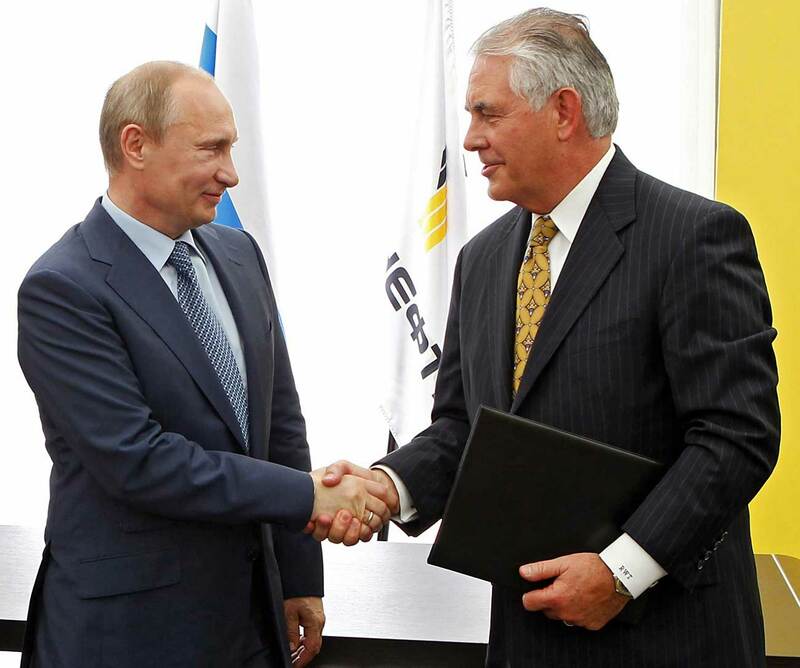 ExxonMobil CEO Rex Tillerson, who has been nominated by President-elect Donald Trump as the new U.S. secretary of state, is a solid individual and a great professional, Kremlin aide Yury Ushakov told reporters on Dec. 13. "Russia’s representatives, and not only the president, have good business relations with this person. Everyone considers him to be a rather solid individual, with his own opinion, his viewpoint, and certainly as a very great professional in his sphere," said Ushakov. U.S. President-elect Donald Trump has nominated ExxonMobil CEO Rex Tillerson as secretary of state. "His tenacity, broad experience and deep understanding of geopolitics make him an excellent choice for Secretary of State," Trump said in a statement on Dec. 13. Trump voiced hope that Tillerson "will promote regional stability and focus on the core national security interests of the United States." In comments to Tillerson’s possible nomination, Kremlin spokesman Dmitry Peskov said on Dec. 12 that he expects that the new U.S. secretary of state will show professionalism and a constructive attitude, regardless of who will hold office. Peskov said that Tillerson is known in Moscow. As the CEO of one of the world’s largest oil companies, he had contacts with Russian representatives many times. Asked why the CEO of ExxonMobil had been awarded Russia’s Order of Friendship, Peskov said this award is traditionally given for an activity in developing cooperation in any particular area and contribution to the development of good international relations. Peskov recalled that Russian President Vladimir Putin has held business meetings with Tillerson and his partners several times. The Kremlin spokesman stressed that Moscow is seeking "mutually beneficial and equal cooperation in those areas that are interesting for our countries."